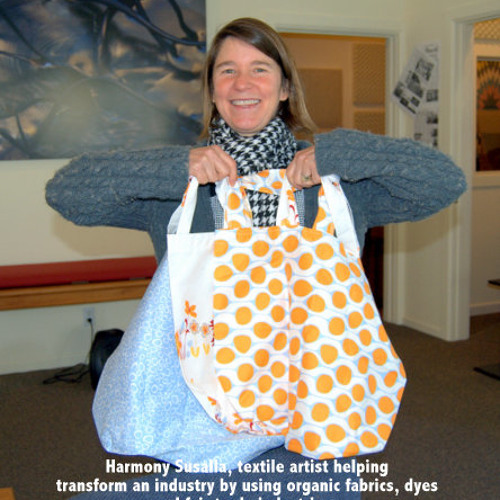 A soft spoken dynamo, Harmony Susalla became a fabric designer almost by accident. Finding fabric design was her passion she fell into a fast track and began working with an established design firm and found herself designing bedding and pajamas that were sold in major retail stores such as Target and Walmart. She helped create the concept of designs for "tweens". After several years she had an epiphany and began focusing her career in developing organic fabrics to use for clothing and shopping bags. In order to do this Harmony told me, "I realized I'd have to change an industry". Listen in to this chat with an inspiring and engaging entrepreneur.